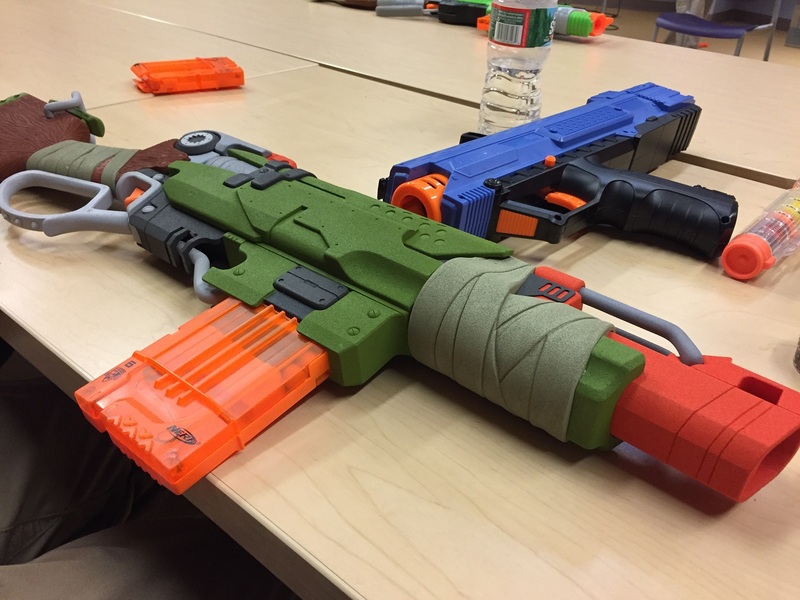 Ever wonder what blaster ideas are bandied about by Nerf designers that never see the light of day? 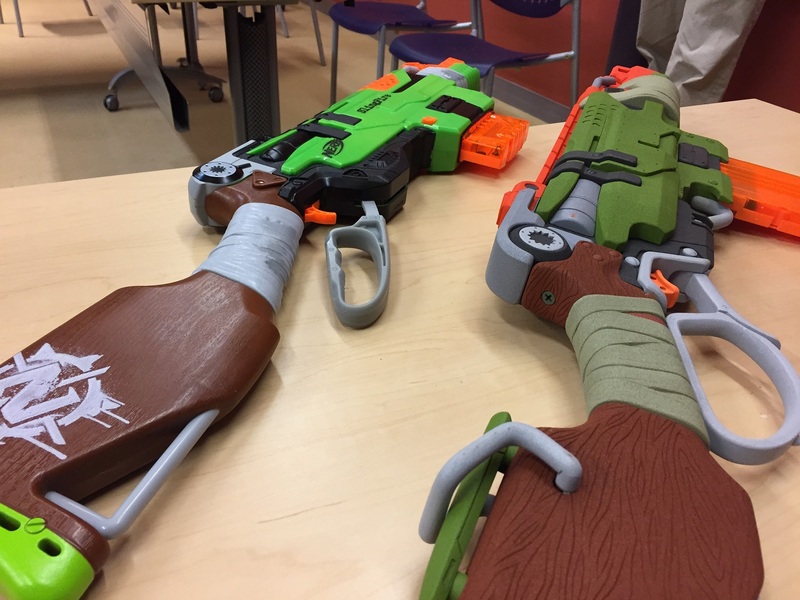 It’s every Nerf fan’s dream to be part of the behind-the-scenes decision-making process. 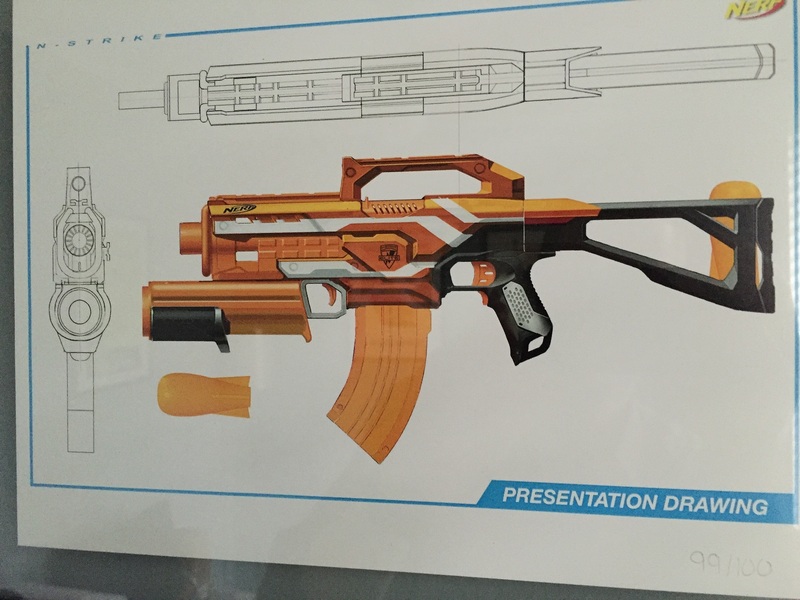 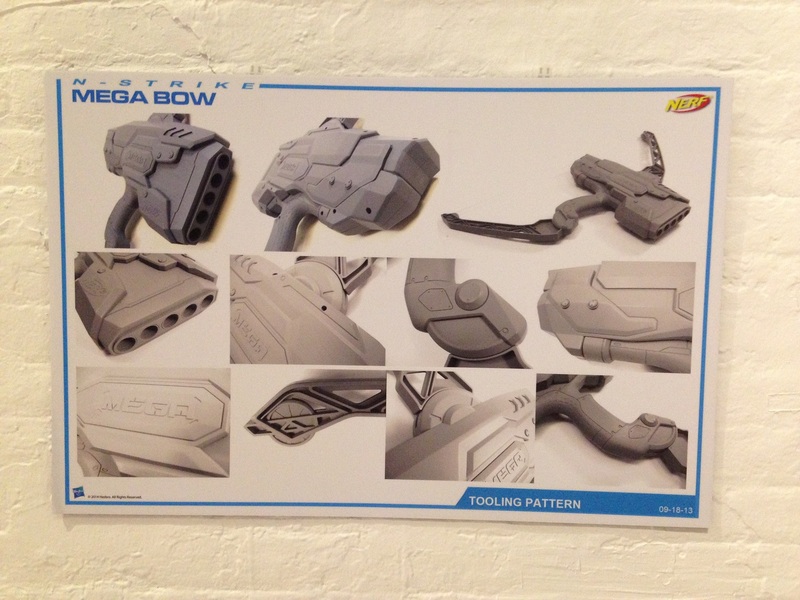 Most of us will never get that opportunity, but Hasbro has been kind enough to let us see a few Nerf prototypes and design schematics, giving us a rare peak behind the curtain. 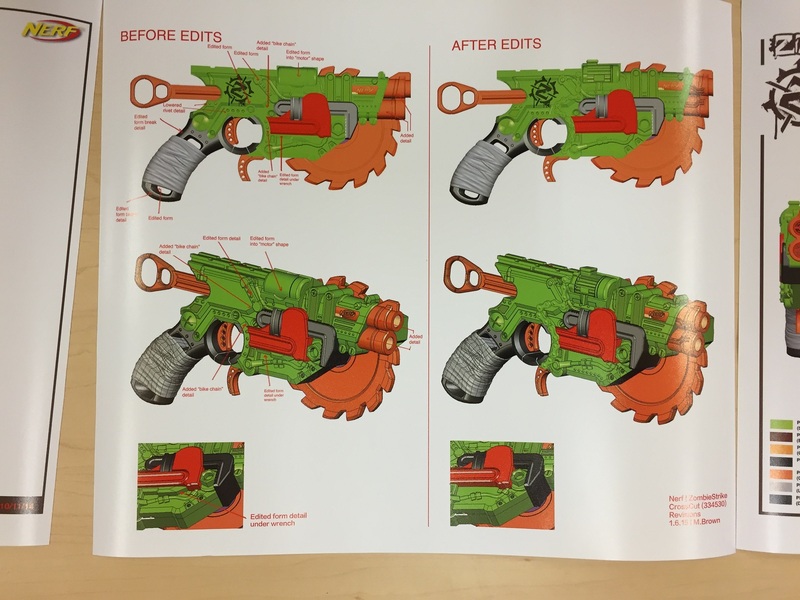 I’ve been privy to talk to several members of the Nerf design team over my years of blaster reporting, and one thing is always clear: the first design is never the final design. 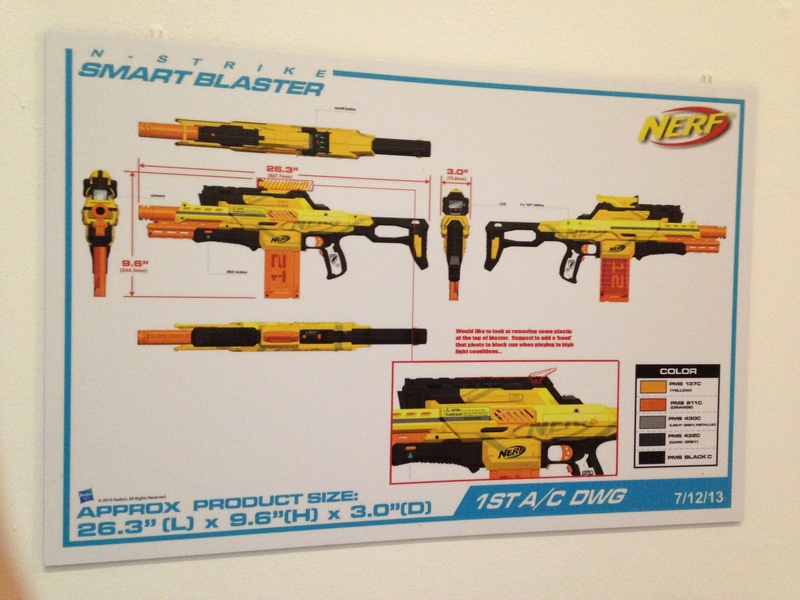 Some blasters (such as those found in the Nerf RIVAL product line, for instance) can be 3, 4 or even 5 years in development. 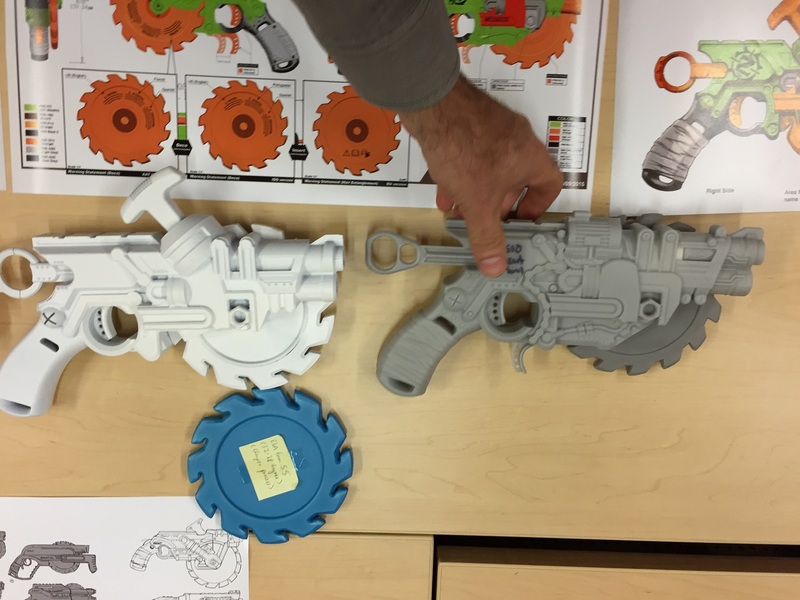 Most take less time–more like a year or two. 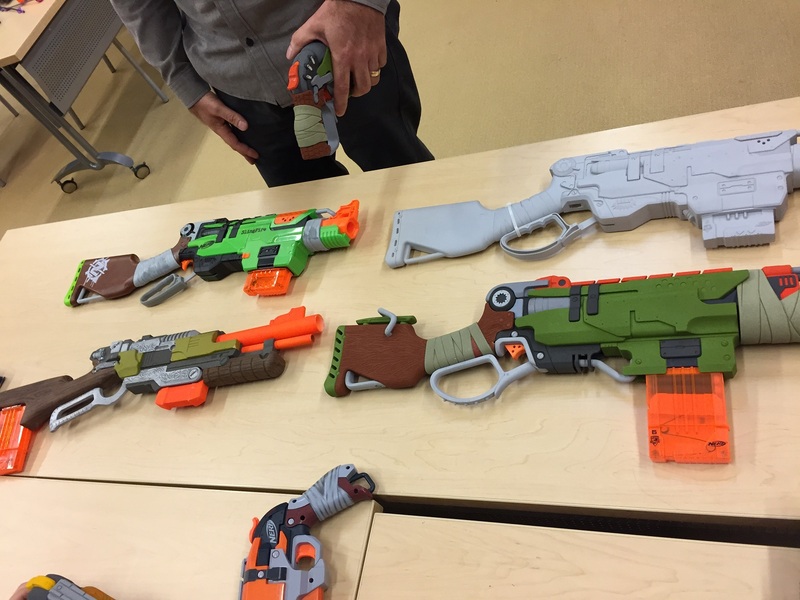 But that still leaves plenty of opportunity for Nerf prototypes to be tweaked, revised, or reworked. 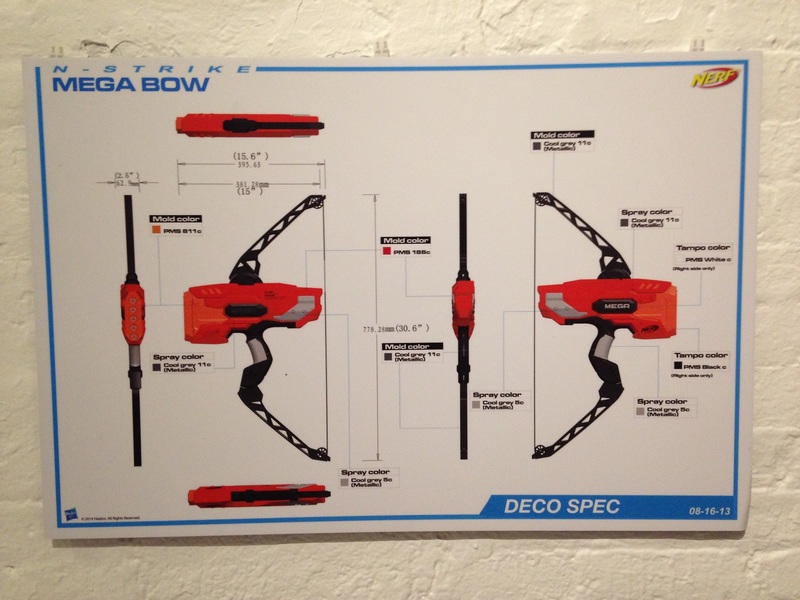 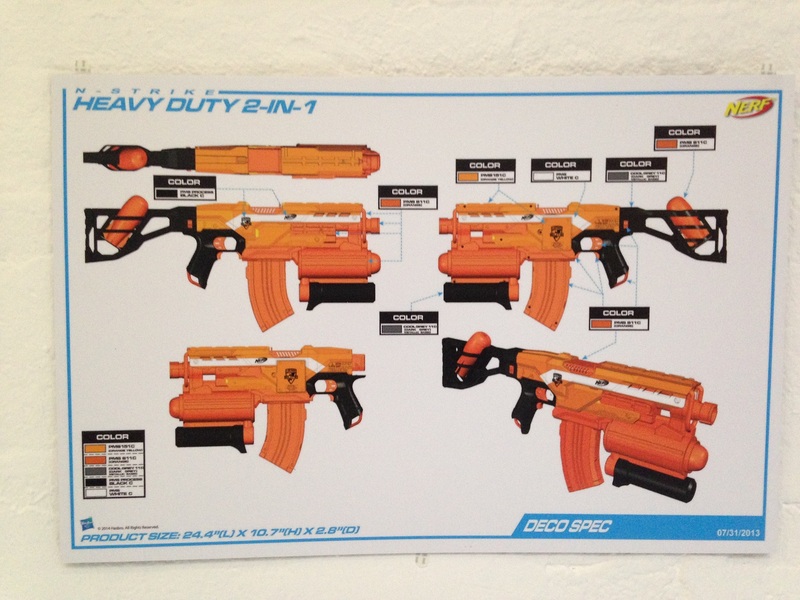 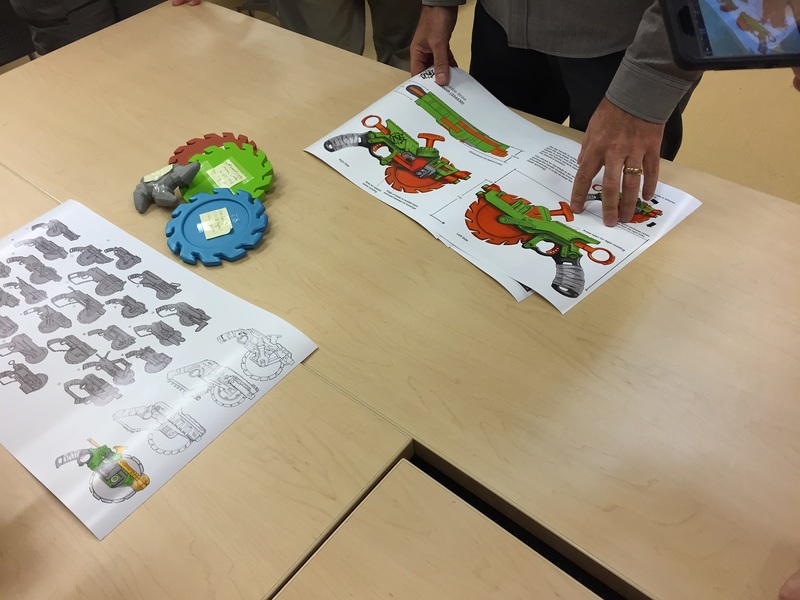 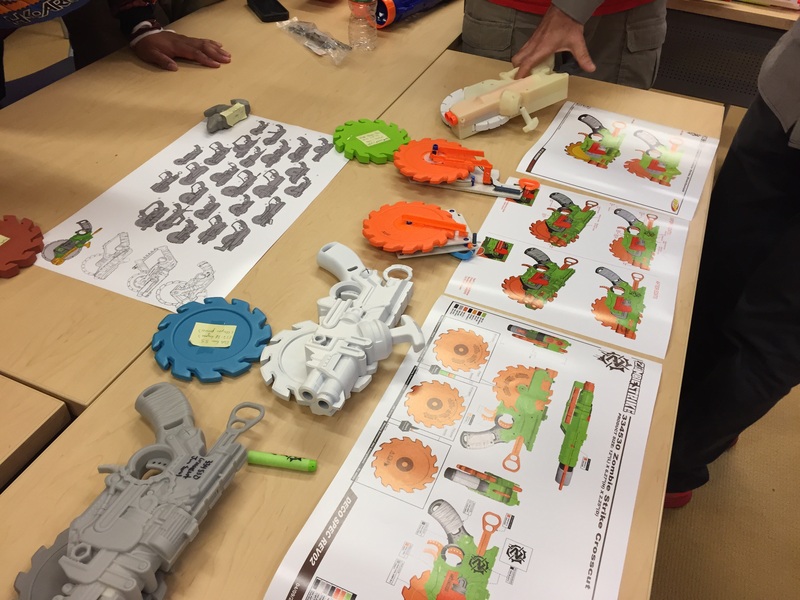 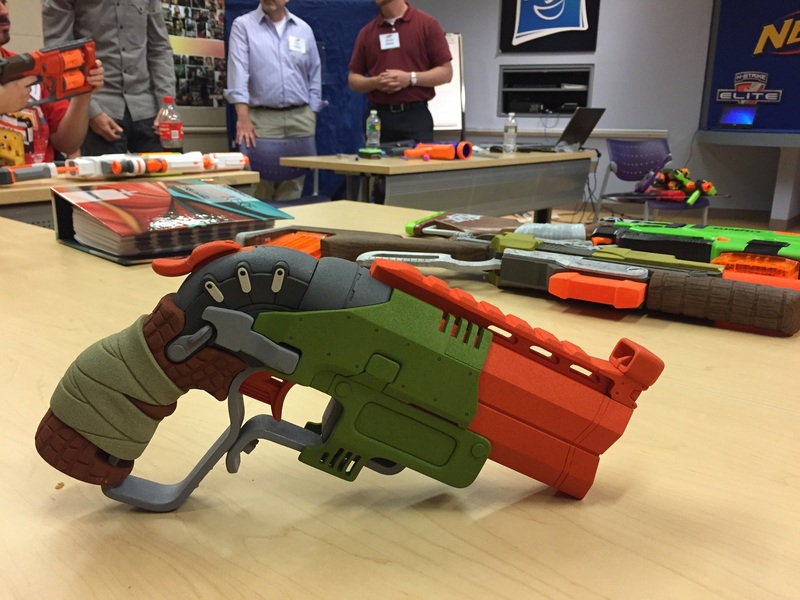 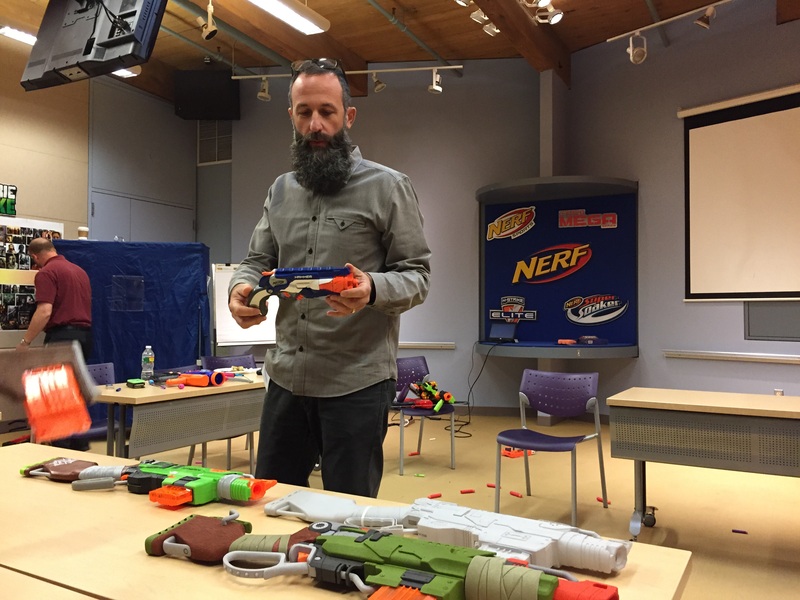 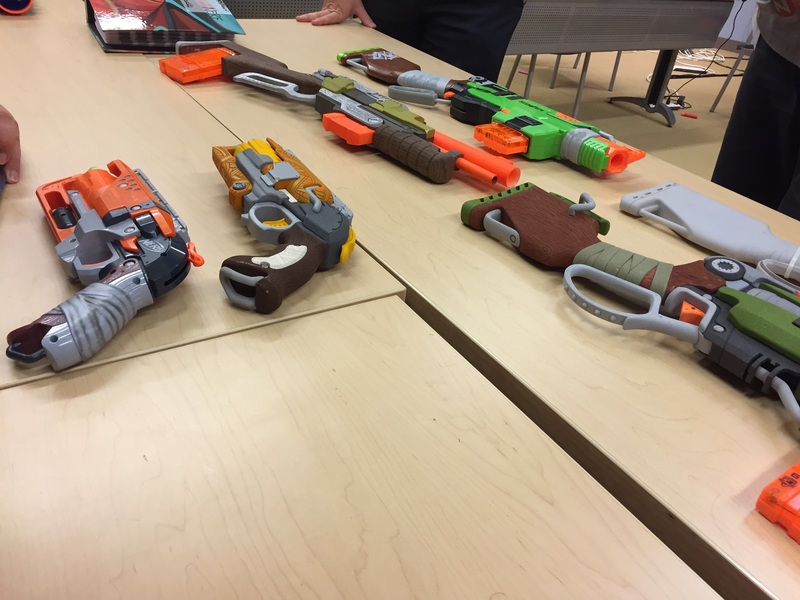 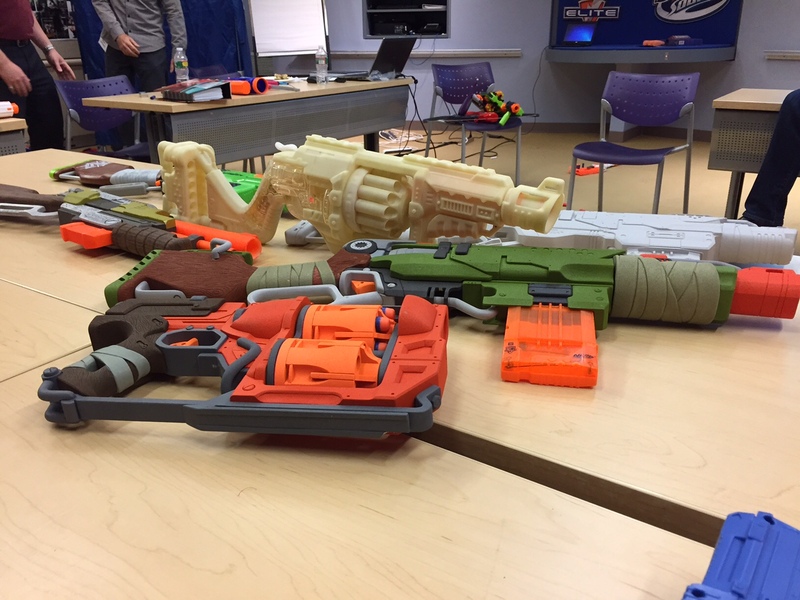 Last year I took a tour of “Nerf HQ” at the Hasbro headquarters in Pawtucket, Rhode Island, and saw a glimpse of just how many revisions a blaster model might go through before it makes it to production. 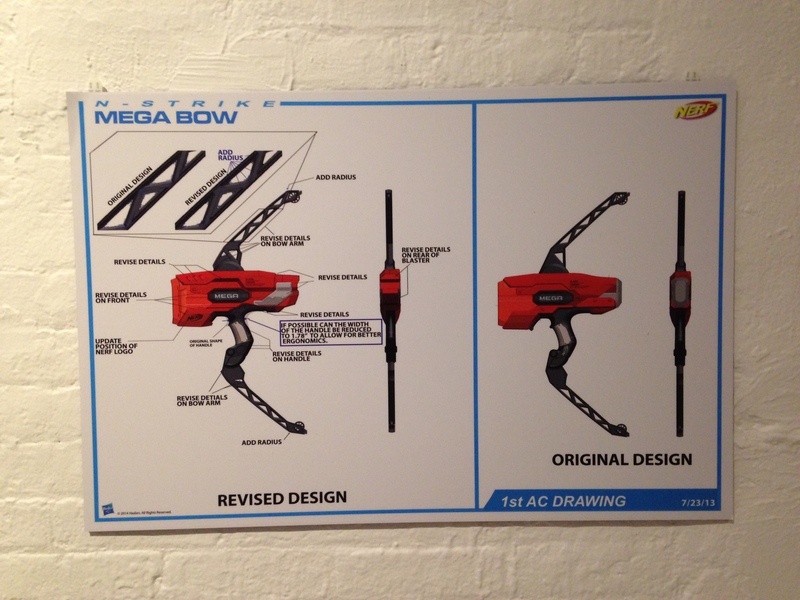 For the most part, these early design ideas never leave the building. 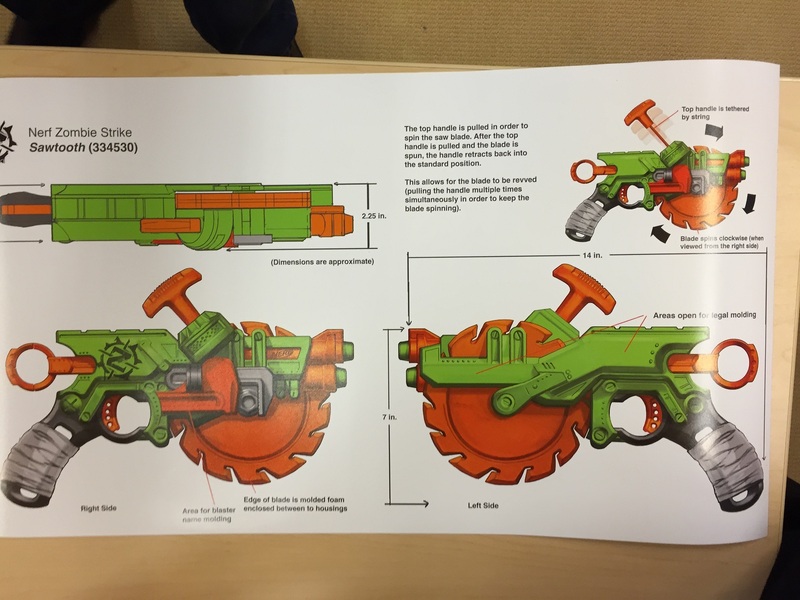 But every now and then, the Nerf team shares a bit of the thinking that led to the final product. 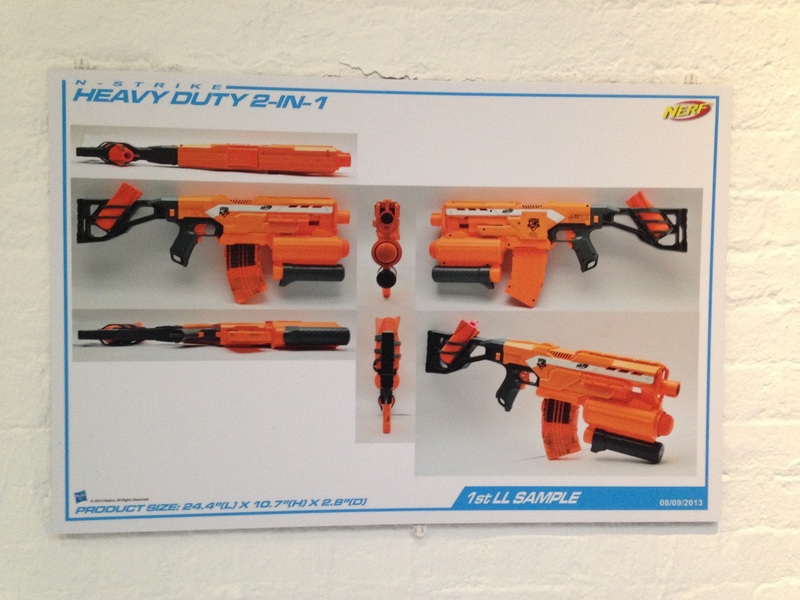 Following are a few examples I’ve collected from invite-only events–these images were mostly taken on-premises, so apologies for the shaky-cam image quality! 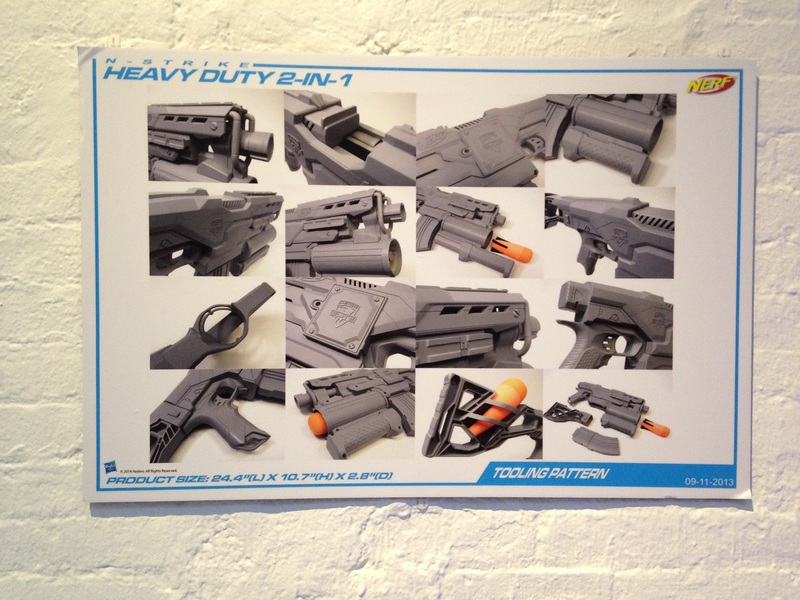 By the way, for those visiting from the Nerf sub-Reddit, some of these images might look familiar. 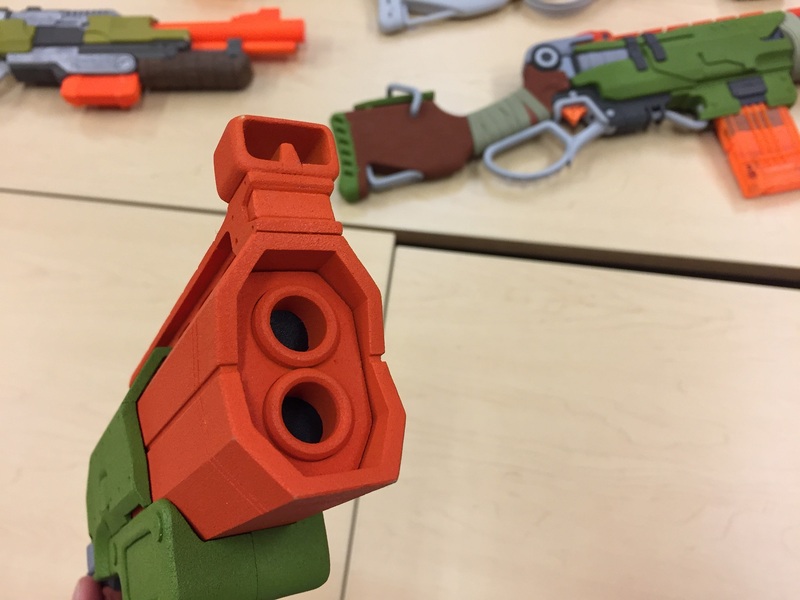 I’ve shared them variously over the last year or two as I’ve traveled to different Nerf events (and some YouTubers have likewise “borrowed” them for their channels). 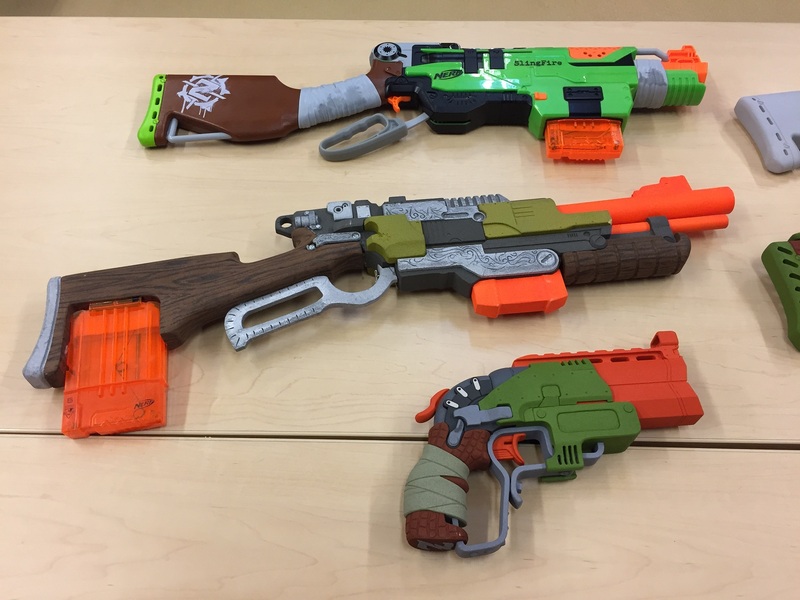 But I thought it might be worthwhile to put them all into a single post for those who might not have seen them previously. 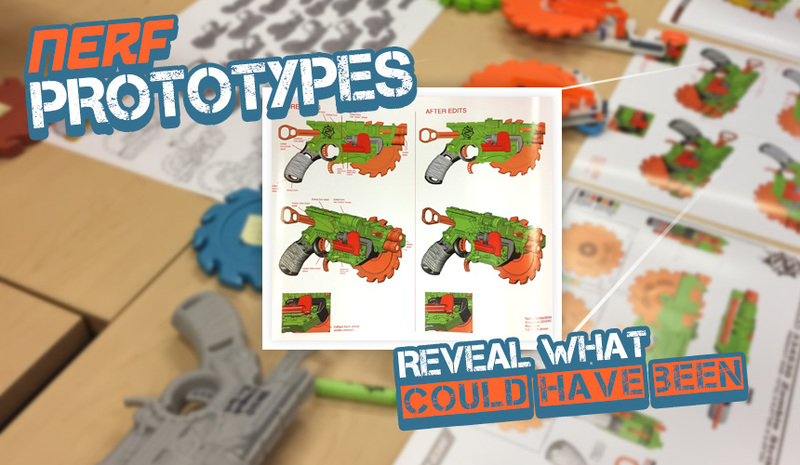 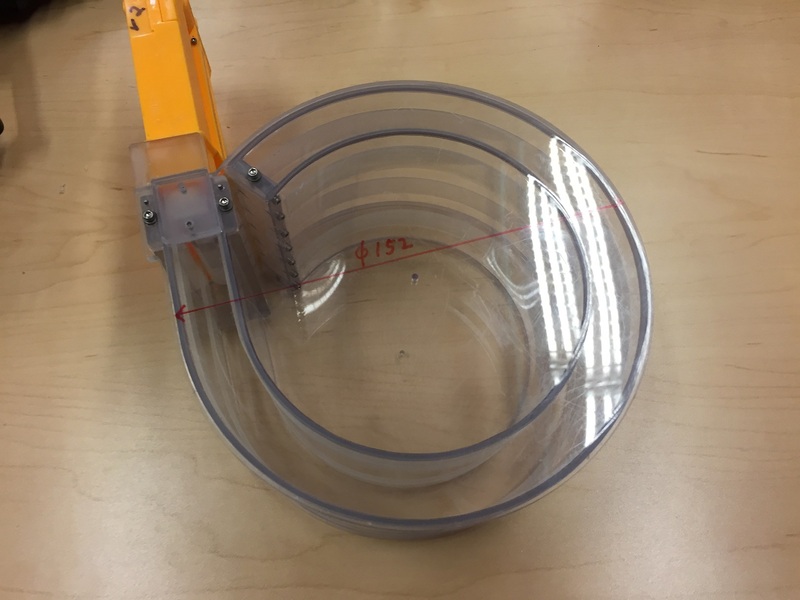 Figure out what Nerf prototype or early drawing belongs to what final product (pretty easy). 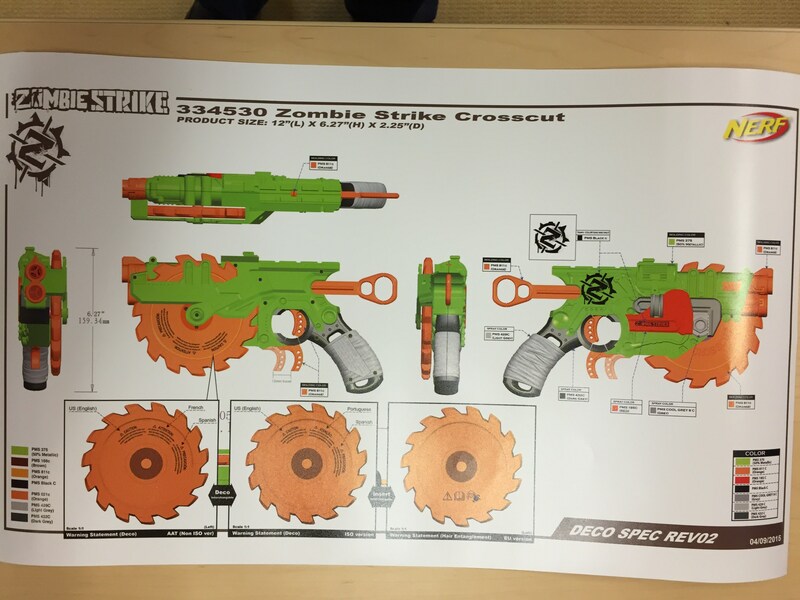 Figure out which Nerf products had a name change somewhere in development. 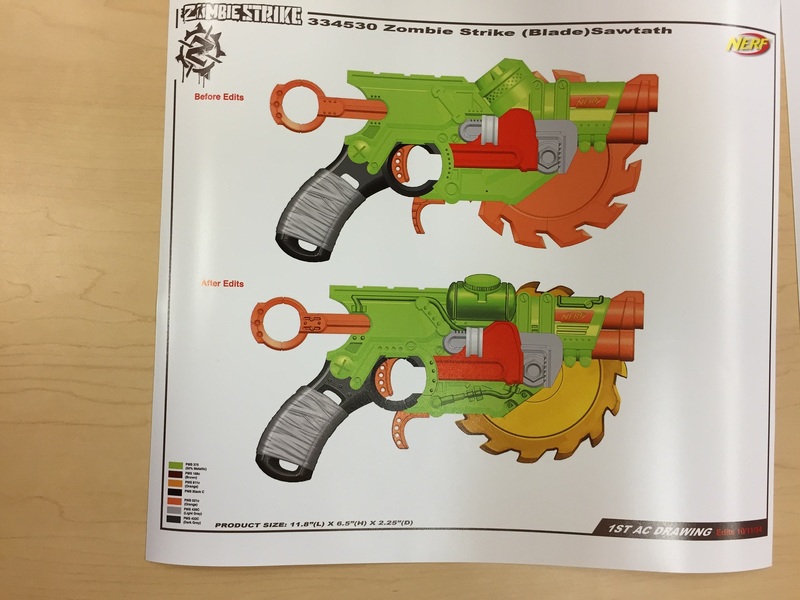 Attempt to spot the differences between the drawings or prototypes and the retail versions (in some cases, it’s very difficult to spot these since what I was shown was pretty close to the final product). 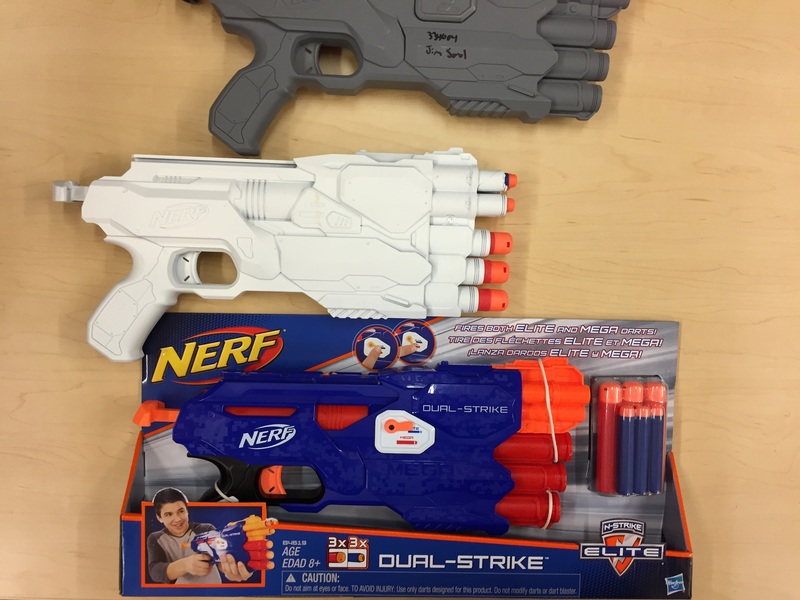 This entry was posted in Blaster Hub: Exclusive, Just For Fun and tagged nerf, Nerf prototypes on May 20, 2016 by PMindemann.